BLACKSBURG, Va., March 29, 2010 – J. Michael Kelly, former dean of Virginia Tech's College of Natural Resources at Virginia Tech, has been conferred the "dean emeritus" title by the Virginia Tech Board of Visitors. 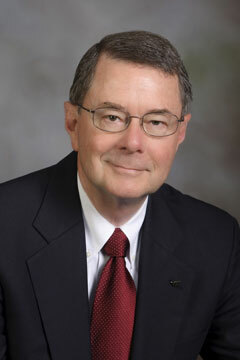 Kelly was named as the college’s second dean in 2004, and retired from that post in 2009. During his five year tenure, the college saw numbers of new students double, programs expanded to reflect Virginia Tech’s strategic plan, and external research dollars increased by more than 60 percent. Kelly has also worked with Virginia Tech colleagues to establish preferred partner agreements with the College of Forest Sciences at the Universidad Austral de Chile and the College of Forest and Environmental Sciences at Kangwon National University in Korea to encourage a wide spectrum of opportunities, including academic programming such as study abroad, internships, practical training, distance learning, and cooperative education; exchanges for research, training, or teaching; collaborative research projects, workshops, or conferences; and exchange of other institutional professionals or information. Prior to joining Virginia Tech, Kelly served as chair of the Department of Forestry and later the Department of Natural Resource Ecology and Management at Iowa State University. He also spent 20 years with the Tennessee Valley Authority and worked as a research associate in the Department of Forestry and Natural Resources at Purdue University, an associate ecologist for the NUS Corporation in Pittsburgh, a pre-doctoral research fellow at Oak Ridge National Laboratory, and an assistant professor of biology at Ferrum College. A Fellow of the Soil Science Society of America, Kelly has authored and co-authored in excess of 100 articles on forest soils, tree nutrition, and air pollution impacts for professional journals and is a Certified Professional Soil Scientist. He has been on the editorial board for Forest Ecology and Management and has served as associate editor for Forest Science and the Soil Science Society of America Journal . He has been listed in Who’s Who in Science and Engineering , Who’s Who in America , and Men and Women of Science . Kelly has been active in numerous professional organizations and activities. He helped develop and served as chair of the National Acidic Deposition Program/National Trends Network, has served on the National Association of Professional Forestry Schools and Colleges Executive Committee, has been a member of the board of directors of Trees Forever, and was appointed an ex-officio member of the board of directors of the Virginia Forestry Association. He has been a technical reviewer for numerous grants programs, and chaired both the Iowa Chapter of the Society of American Foresters and the North Central Region of the National Association of Professional Forestry Schools and Colleges. Both the Tennessee Valley Authority and the Electric Power Research Institute presented him with special awards for bridging the gaps between research and policy applications. Kelly received his bachelor’s degree from East Tennessee State University and a master’s degree and Ph.D. from the University of Tennessee.